I became interested in Reiki in 2005 ,when out walking with a group of friends, one of them was talking about a Reiki share that she went to on a monthly basis, and had done so for many years and we talked about the benefits she felt with Reiki being part of her life. I have always had an interest in complimentary therapies, and for quite a few years practised Okada Ki massage. As the popularity grew for the use of alternative practices as a preventative or complimentary to conventional medicines I felt the need to explore further therapies which I could practice which were practical and hands on. It was like a light went on in my head! I wanted to know more about Reiki! On arriving home after the walk I searched the internet, looking through so many different sites, and came across Reiki Evolution website. It was really user friendly and full of so much information that I decided to go for it. The teaching guides formulated by Taggart King are practical, easy to use and are yours to keep for permanent reference. 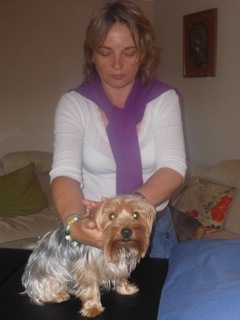 This enables the training day to be hands on and focus on the practical aspects of Reiki in a relaxed environment. By the end of 2005 I had completed Shoden (Reiki 1) which enables you to treat friends and family and carry out self healing meditations and Okuden (Reiki 2) which allows you to practice as a practitioner. I soon began to attract clients who benefitted from their regular sessions almost immediately! Whether it was a simple backache or something deeper like an emotional issue, the changes were subtle but immediate. I practice from home or go to clients houses to give treatments. 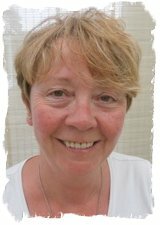 In 2010 I decided to take my Reiki that one step further and was fortunate enough to do my Reiki Master Teacher course with Marilyn Harvey in London. In 2011 I started to run small Sussex Reiki training courses in Bexhill using all the resources offered by Reiki Evolution and I am now delighted to be offered the opportunity to be part of Taggart’s team. With a maximum of four people training at any one time, there is plenty of opportunity to ask questions and feel supported and relaxed in a calm atmosphere. Reiki is a brilliant versatile asset that benefits everyone. It changed my life for the positive right from the start and I can’t ever imagine being without it! After a 25 year career in the hospitality industry, I have spent the past 15 years producing handmade skincare products for people who may be prone to eczema and psoriasis for a small company in East Sussex where I am Production Manager. I do this 3 days a week, and spend the rest of my time teaching Reiki and giving treatments. I incorporate other therapies into my treatments , and often use Reiki healing when treating clients with Systematic Kinesiology or Flower Remedies.